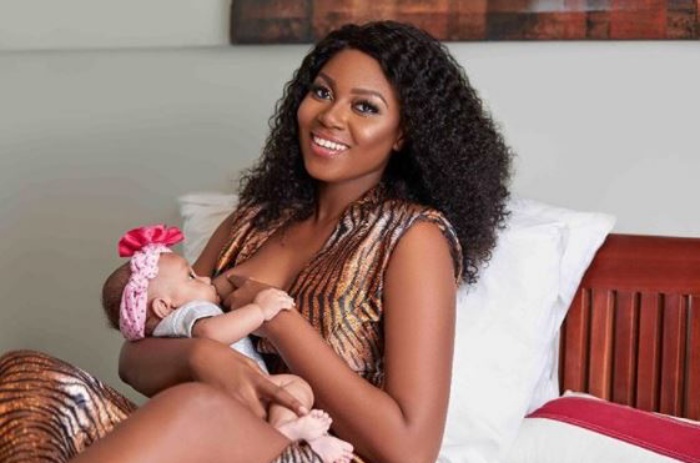 Ghanaian actress and movie producer Yvonne Nelson has vowed she will go all out to protect her baby daughter, Ryn, from people who say unpleasant things about her. The actress survived a lot of controversy for getting pregnant for her UK photographer boyfriend, Jamie Roberts, and eventually giving birth to a baby girl. Many social media commentators and some mainstream media questioned the rationale behind her decision to give birth before getting married and why choosing her photographer boyfriend. Others simply passed a straight verdict on her decision, describing it as “immoral”. But hanging out with the 2018 Ghana’s Most Beautiful (GMB) contestants on Tuesday, the award-winning actress indicated that she is personally unfazed about news stories that put her in a bad light. She stated, however, that she will not take it lightly with people who try to involve her daughter in those stories. She narrated an instance where she had taken on someone – whose identity she failed to disclose – for making some “unpleasant” commentary about her baby. “Like the recent one that happened: I don’t want to mention his name but he was talking about the baby,” she told the ladies. She explained that the name of her daughter is a combination of the initials of her boyfriend and her own names – Robert and Yvonne Nelson (RYN) – and that she wants her daughter to have her parents’ names with her wherever she goes. She used the opportunity to advise the ladies who are vying for the GMB 2018 cash, car and crown never to give up on their pursuits in life even if they fail the first time. The 10 ladies, who were unveiled Sunday, September 16 at Takoradi,were ushered into the GMB Reality House on Monday and are poised for action.